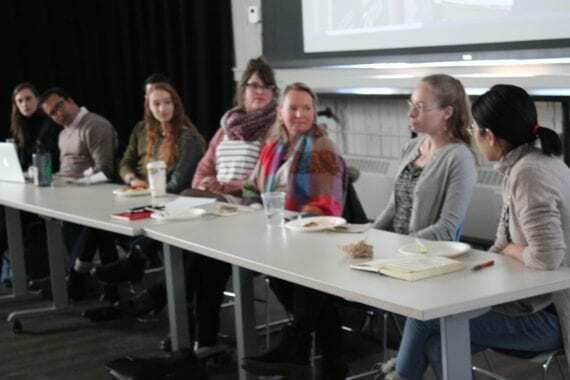 A large group of Tufts students, faculty, and staff gathered on the Medford campus in late January to hear about the experiences and reflections of the Tufts delegates who attended UNFCCC Conference of Parties in Katowice, Poland– COP24. What was so incredible about this sharing was not just the diverse backgrounds and experiences of the panelists, but the depth and breadth of observations they brought home to Tufts from the conference. While some delegates spent more time observing climate negotiations, others shared their impressions of the outside pavilion and side events. All of the delegates were struck by the multitude of climate interests present in Katowice, from indigenous tribe members to coal industry representatives from the United States. One delegate observed that it was a combination of “activism, science, and politics” that created an almost circus-like atmosphere where globally recognized figures, unknown climate scientists, animal habitat activists, and business bigwigs all mixed and mingled like micro-particles in the atmosphere. California’s then-Governor Jerry Brown was a de-facto US representative who peppered the event with impassioned sounds bites such as “The United States, I’m sorry to say, does not represent the people of the United States,” Brown said in a video address to U.N. delegates gathered at the summit. “California, Washington, New York, Vermont and many, many other states representing tens of millions of people believe in the science of climate change, believe -and demand- we reduce our carbon emissions,” the Democrat said. Many of the Tufts delegates were both impressed and inspired by the drive of many attendees to find common ground and implement solutions to earth’s greatest challenges. Delegates were equally dismayed at the slow pace of negotiations and pockets of resistance or lack of knowledge around the science of climate change. While environmental conferences bring progress toward global climate goals, they also highlight many of the obstacles to reaching those goals. Tufts Institute of the Environment is grateful to all of the Tufts delegates who attended the UNCCC Conference of Parties in Katowice, Poland and who took the time to share their experiences with the Tufts community.